Sh'ma Yisro-ayl. If you can read this, you can pray in Hebrew! 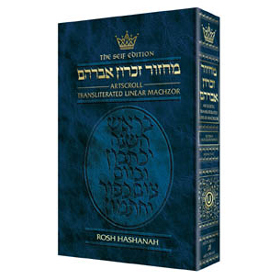 The Seif Edition ArtScroll Transliterated Linear Machzor is now available for Rosh Hashanah & Yom Kippur. Understand the Dots, Vowels and Cantillations. Can't read Hebrew yet? - It's for you! Want the translation in front of you, phrase by phrase? Want it all, including an ArtScroll commentary? Want a Machzor to introduce your friends to Judaism? Want illuminating essays on every part of the prayers? Want clear instructions as the prayers proceed? Then this Machzor is for you! This Machzor has the crisp, clean, creative ArtScroll typeface and layout. The transliteration follows the Orthodox Union's phenomenally successful NCSY formula. The translation is from - and the commentary distills the best of - ArtScroll's classic Machzor. New introductory essays by Rabbi Benjamin Yudin exemplify his unique blend of scholarship and warmth.This is a Machzor that belongs in every household and synagogue - especially those with open arms to people who are sincerely searching for their Jewish roots. With the Seif Edition Machzor in their hands, no guests need ever feel like strangers in an Orthodox shul. See it. Try it. You'll want to have it. And you should!